Do you have a child like mine that likes to build, create and use their fine motor skills? My son LOVES building and creating like his Daddy using tools so we are loving the NEW Count & Build TotBot™ from Learning Resources in our house! 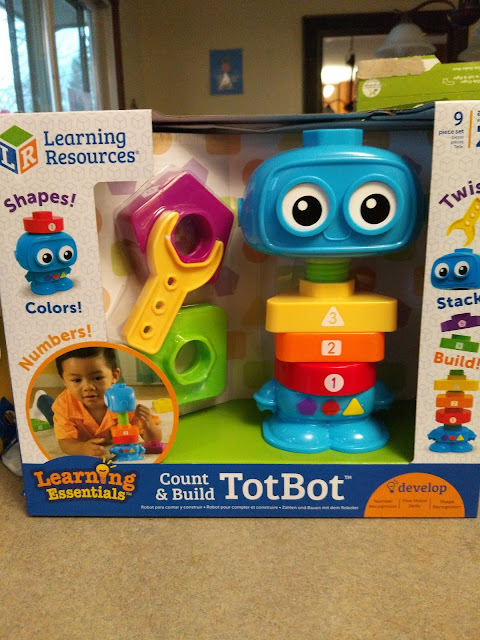 The new Count and Build TotBot will help young children learn their numbers, shapes, and colors while working on the fine motor skills necessary to twist and turn the bolts on their new robot friend. Children definitely have a blast using an easy-to-hold wrench to build their very own robot. Using fine motor skills, they will twist color, shape, and number pieces (1–5) into place. It measures 8”H when complete. As a preschool teacher, Learning Resources is one of my favorite educational toy companies. Their products never disappoint and the Count & Build TotBot is no different! This toy is great for working on fine motor skills while also working on intellectual development. Plus, children will love using their own tools and building like grownups! Learning Resources is generously offering (1) Count & Build TotBot to a lucky winner!